In this tutorial I'm going to explain Lightroom Color Grading and how you can use it to enhance your photography. I've also produced this accompanying video to demonstrate the technnique. I published this on my YouTube channel. Subscribe to my YouTube channel for free to ensure you don't miss future videos. If you’re not sure what Color Grading is, there’s a useful definition on Wikipedia. It’s a very popular process in cinematic filming; for example, in night time scenes where a cool blue tone is often added. 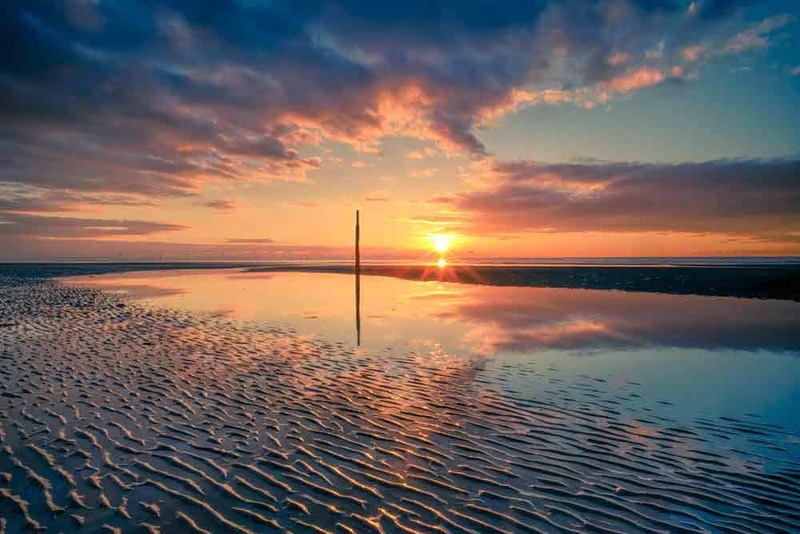 In this example we will be Color Grading a sunset image to make it appear more vibrant and colourful. The starting point for your Lightroom Color Grading should be an image that you have already corrected and enhanced. The Color Grading should be a final creative step. In the following screenshot you can see the corrected image below at the start of the process. Here we want to improve the strength of the orange in the sunset, but also to strengthen the blue in the sky. 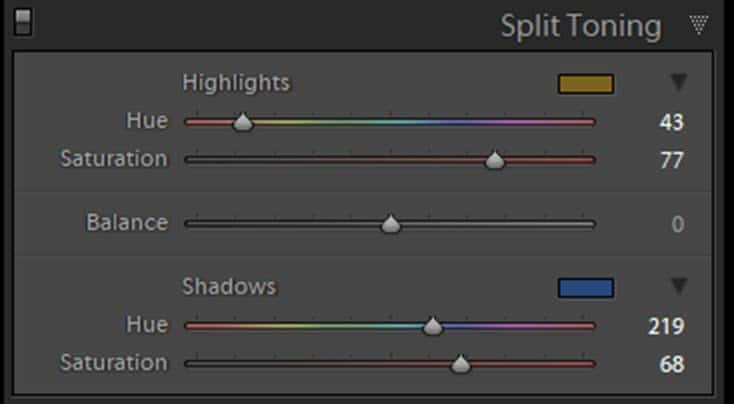 We will apply our Lightroom Color Grading using the Split Toning panel in the Develop module. You can see a screenshot of the panel below. Using the Split Toning panel, we will add orange to the Highlights and blue to the Shadows. Rather than using the Hue and Saturation sliders to do this, click the colour swatches as indicated in the screenshot. 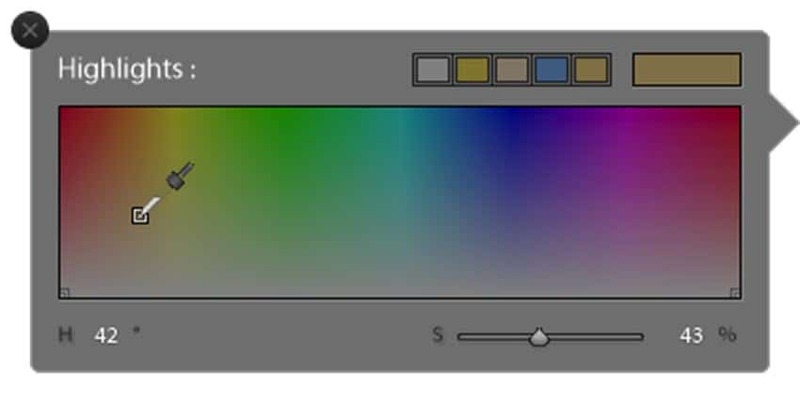 This displays the colour picker dialog which is helpful in selecting suitable colours. You can see a screenshot of the colour picker below. It’s important to note when selecting the Highlights colour, try to use a colour that will enhance the highlights in the scene. This may take a little fine tuning once you have made your initial choice. The way to read the colour picker is as a chart. The horizontal axis moving left to right represents the different colours in the colour wheel whilst the vertical axis represents the level of saturation. Towards the bottom there is little saturation but further up, the saturation increases. When selecting a colour, don’t worry too much about the level of the saturation. You will be able to adjust this later using the Saturation slider. If required, you can also fine tune the selected colour using the Hue slider. Select suitable colours and levels of saturation for both the Highlights and Shadows. You can see the settings I chose in the screenshot below. These produce an effect on the image as shown below. Notice the Lightroom color grading gives a nice retro feel to the image. Many people like this effect which I suspect explains some of the popularity of Instagram. But if you want to achieve a more natural result you need to apply further processing in Photoshop. The first step in “correcting” our split toned image is to produce two versions of the image. The first will emphasise the oranges in the scene (the Highlights) whilst the other the blues (the Shadows). Move the Balance slider left and right to achieve these effects. When you move the Balance slider to the right you increase the amount of the Highlight tone applied to the image, whilst simultaneously reducing the tone applied to the Shadows. When you move the Balance slider to the left, it does the opposite. Start by producing a Highlights version of the image by moving the Balance slider to the right. Export this to Photoshop. Next produce a Shadows version of the image by moving the Balance slider to the left and again export this to Photoshop. 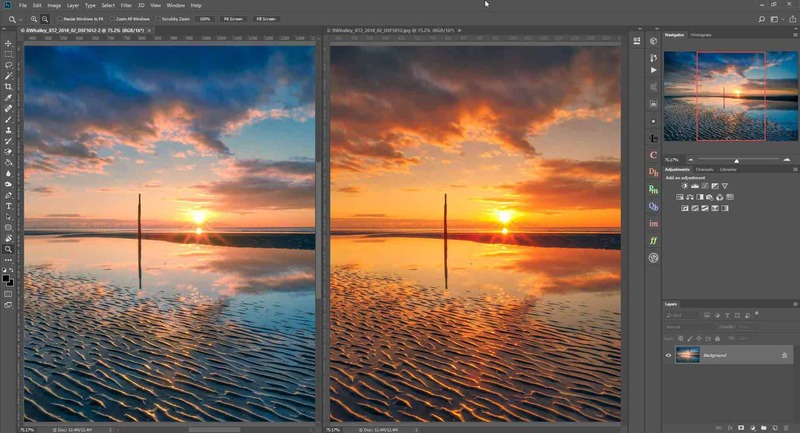 You should now have two versions of the image open in Photoshop. You can see this in the following screenshot, where the images are shown side by side. We will call the blue version of the image on the left “Shadows” because we created it when we increased the toning to the shadows. We will call the image on the right “Highlights”. Choose to work on the Highlights version (emphasises the Orange) of the image by clicking it. Now select the entire image by pressing Ctrl + A on your keyboard. If you’re using a Mac that’s Cmd +A. Copy the selected image by pressing Ctrl + C on your keyboard. On a Mac that’s Cmd + C.
Click the Shadows image (emphasises the Blue) to select it. You can now paste the copied image by pressing Ctrl + V on your keyboard. Or, if you’re using a Mac press Cmd + V. This will paste the copied Highlights image into the Shadows image as a new layer. You can then close the Highlights image as we won’t need it again. There are lots of ways to blend the two images together, but we are going to use a mask. We can create our blending mask from any of the colour channels (Red, Green or Blue) in either the Shadows or Highlights layer. Which is best depends ultimately on the look you want to achieve in the finished image. For this example, we are going to create a Luminosity Mask. You can do this by holding down the Ctrl key on your keyboard (Cmd on a Mac) and clicking the RGB channel in the Channels window. This loads the RGB channel as a selection based on the tones in the image (how dark or light an area is). You can create the selection using either the Highlights or Shadows layer in the image. If you want to load the Shadows layer as a selection, hide the Highlights layer whilst you click on the RGB image. Just remember to make the layer visible again after you have loaded the RGB channel. For this example, we will use the Shadows image to create the mask. After loading the RGB channel you will see the “marching ants” around the selected areas. You can then click the Highlights layer in the Layers Window to select it. 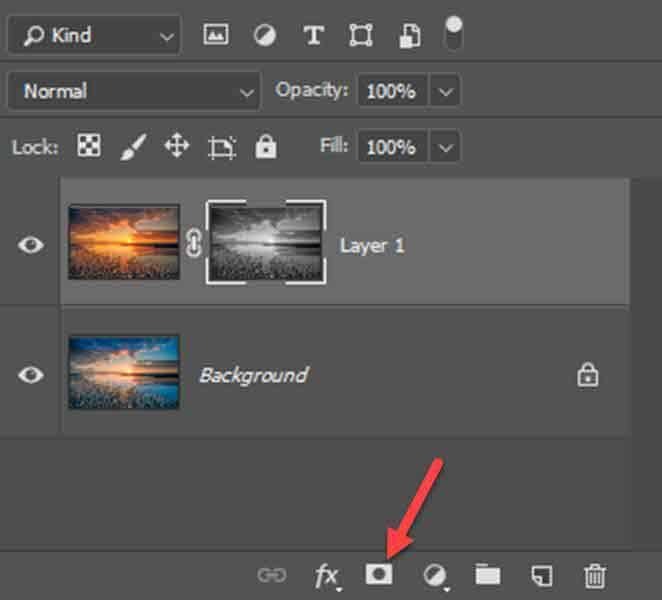 Next, click the “Add new Layer Mask” icon at the bottom of the Layers Window. You can see the icon indicated in the screenshot below. 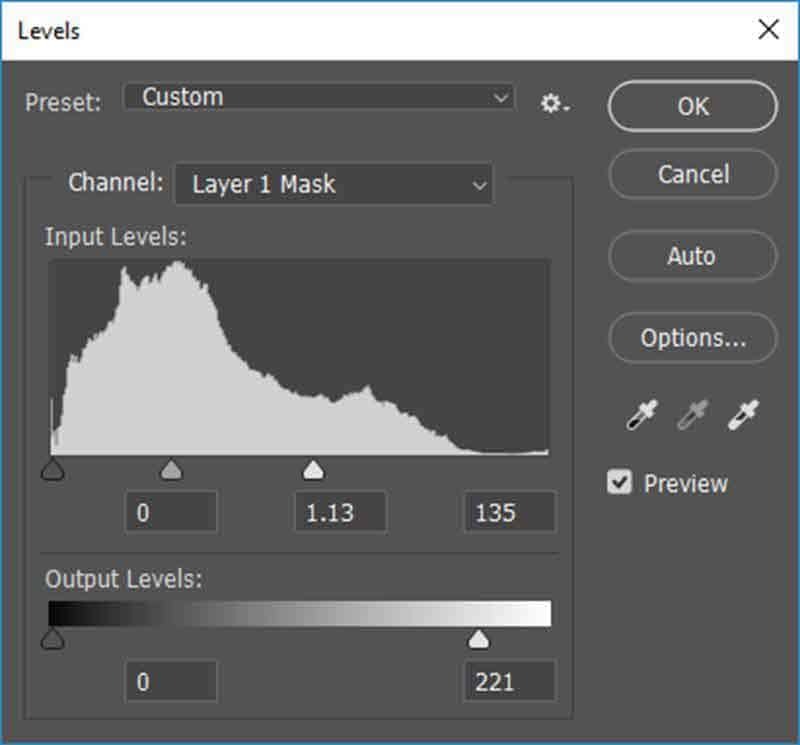 When you add a new layer mask to a layer, the active selection is converted into a mask. You can see the new layer mask has been added in the screenshot above. Where the mask is dark it hides the orange in the Highlights layer, allowing the blue from the Shadows image to show through. Where the mask is light you see the orange from the Highlights layer. You can see the blended image this creates below. This image is an improvement and appears more natural than the initial split toned version. But we can further improve the image by adjusting the Luminosity Mask. To adjust the mask, first click on it in the Layers Window to ensure it’s selected. Now we can refine it by applying a Levels adjustment directly to the mask. In the Photoshop menu click “Image | Adjustments | Levels…”. This opens the Levels dialog, which will be applied directly to the mask. We can use this to control how light or dark areas of the mask are and therefore how much or how little of the Highlights layer is seen. In the screenshot below you can see the Levels settings I applied to the image. Notice I have chosen to make changes to the midtone and white Input Levels. The white Output Level has been changed but the black levels in both the Input and Output section are unchanged. The effect of this is to lighten all the tones except for the blacks which remain unchanged. By lightening the mask more of the orange from the Highlights layer is seen in the finished image. You can see the results of this in the finished image shown below. Want to Know More About Color Grading? 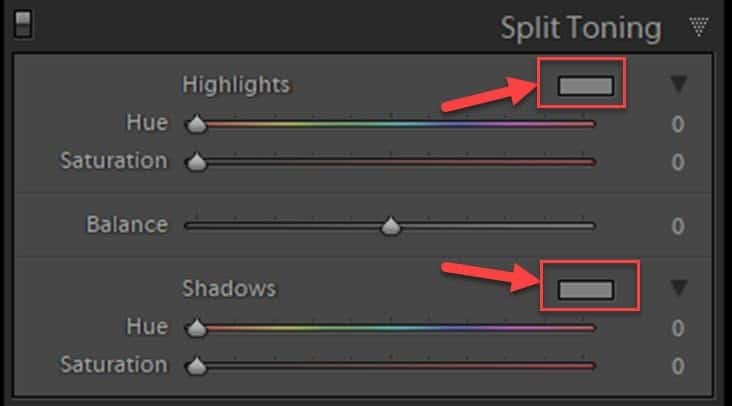 I hope you've enjoyed this article explaining the Lightroom Color Grading process. Lightroom isn't though the only tool you can use. Photoshop can also be use for Color Grading photos and it offers even greater felxibility than Lightroom. If you want to know how, this video tutorial on using Photoshop Color Grading for Landscape Photography will explain.